The striking color of this harvestman which is fairly common species in the Sonoran Desert during the cooler months should make it an easy identification. White Tanks Mountains Park, Maricopa Co., Arizona, USA. January 2012. In this photo the head is facing down. Desert Harvestmen have eight, very long, slender legs. But they're not nearly as long as most temperate species which are also commonly known as daddy long-legs. 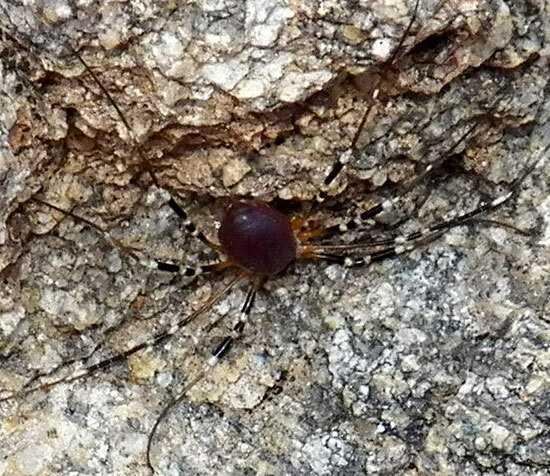 Harvestmen look like spiders but unlike spiders they never spin or inhabit webs. Also the body has no obvious divisions - the cephalothorax and abdomen are broadly joined. Desert Harvestmen, like most other harvestmen are probably scavengers that feed on dead insects. They are harmless and do not bite or possess venom. Probably the most astonding feature beyond the ultra-slender legs is the mid-body turret upon which the simple eyes are attached.